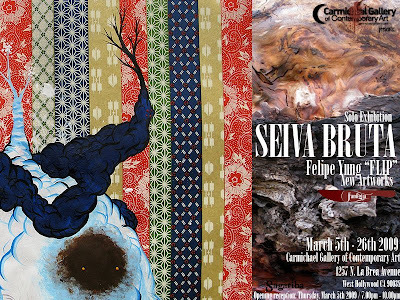 Carmichael Gallery of Contemporary Art is proud to present Seiva Bruta, the first West Coast solo exhibition of work by Brazilian artist Flip. Artwork featured in the exhibition will include acrylic, ink and mixed media on wood, canvas, and paper as well as a site specific installation. An opening reception will be held on Thursday, March 5th, 2009 from 7.00pm - 10.00pm with Flip in attendance. The exhibition will be open for viewing through Thursday, March 26th, 2009 from 1.00pm - 7.00pm. A member of the renowned artist collective Famiglia Baglione, Felipe "Flip" Yung is widely hailed as one of the most talented Brazilian artists of his generation. He has painted and exhibited his work throughout the streets and galleries of Brazil, Europe, and the US for over a decade. Comecou ontem a exposicao do meu amigo e artista que respeito por sua dedicacao e atitude alem de grande amigo e membro da Famiglia. Se voce estiver na califa ou estiver indo pra la durante esses dias, vale a pena conferir ! A exposicao vai ate o dia 26 de marco.